"My guitar buzzes when I play it." Every so often I'd use that line to a customer when it seemed like everyone was ready for a little chuckle. Eventually I did see a guitar that buzzed because of bees -- well, mud dauber wasps, really. The wasps had started building a nest inside near the bridge and the dried mud was loose and rattling. Of course that day I hadn't told my little bee joke, so once again, I didn't get credit for extreme wisdom. Your entire guitar vibrates when you play it. The top most of all, but even the neck and peghead are moved by the vibrating string's energy. Any loose part anywhere on the guitar may buzz or rattle audibly, some times sympathetically only when certain notes are played. Parts don't have to be visibly loose to rattle and it can be quite a job to chase down the causes of some of these little noises. 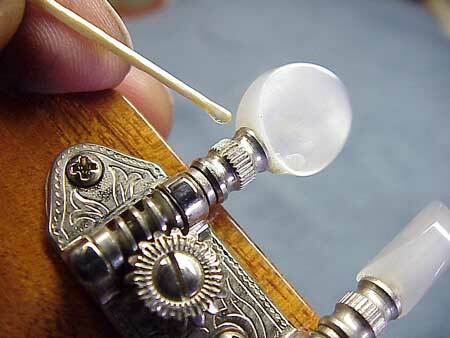 Often a loose, rattling part can be located by "rapping" with your knuckle on the instrument in various places. If you knock on the body, and the noise appears to come from the neck, then there's probably something loose at the neck or peghead. If the noise occurs only when you rap on the back, then there's probably a brace loose inside there, and so on. If you're trying to track down a mystery buzz, don't forget to check out the Buzz Diagnosis Pages. 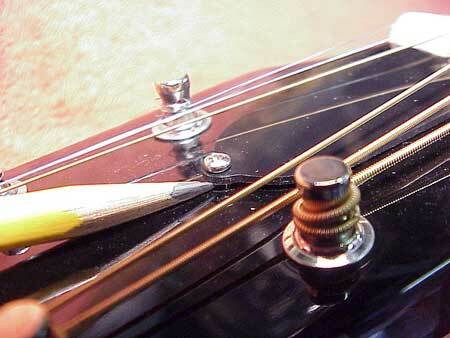 Let's take a look a some of the parts of an acoustic guitar that may speak for themselves if they become loose. Clearly, most other fretted instruments have analogous parts and problems, so most of these considerations will apply to mandolins, banjos, etc. The headstock is an obvious place to start because there are always things screwed on there. 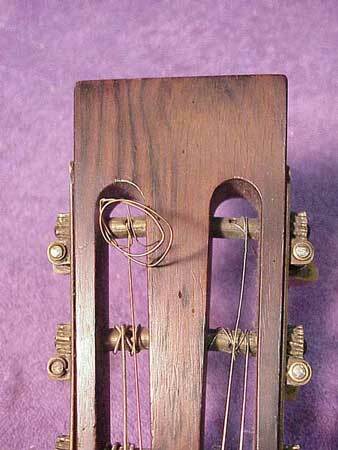 Most all the parts of the tuners have the potential for looseness and rattling. 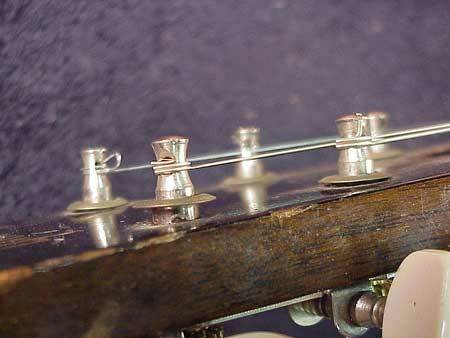 The nuts that screw down from the top have thin washers under them to protect the face of the headstock. They are screwed tight when the guitar is first assembled, but may become loose because the wood compresses a bit. 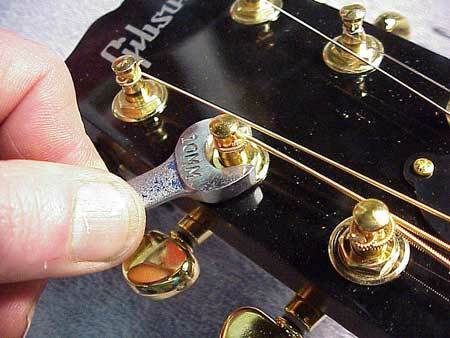 After the guitar is a few months old it's a good idea to tighten these nuts a bit. 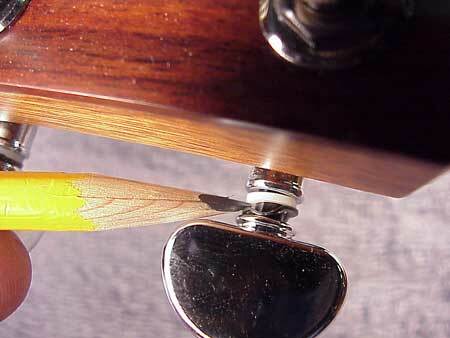 Rattling washers are among the most common loose items on a guitar headstock. Simply tightening the screw will fix this one nicely. 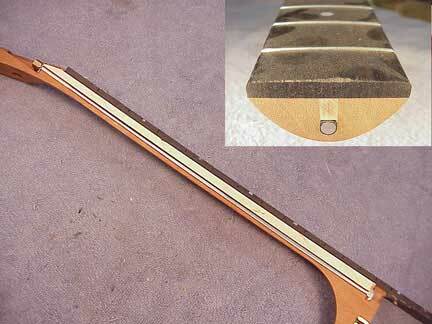 Rattling, loose truss rod covers are not common, but they certainly are annoying. 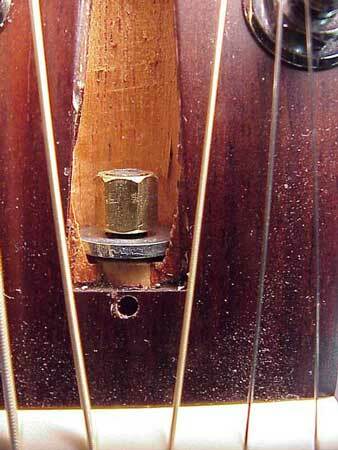 Even if no tension is needed on the truss rod it's generally a good idea to tighten the truss rod nut just enough to keep it from coming unscrewed and allowing the washer to become loose. Here the string is held at just the right distance to cause it to buzz with a peculiar "fuzzy" note. 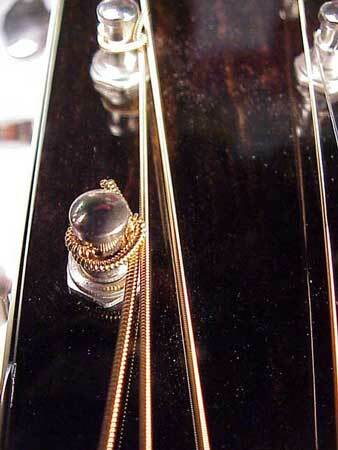 You can avoid this rattle by noticing how the string touches its neighbor when you restring the guitar. If the design of the peghead won't allow enough clearance, then make sure the string rubs tightly against the post by adding a few extra turns around the offending post. The string should either miss the post altogether, or it should be held against the post tightly enough so it doesn't rattle. 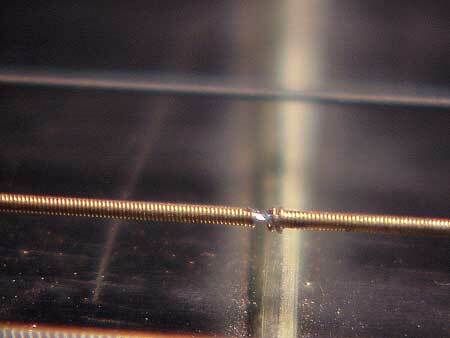 It may sound tricky, but it is very easy to keep this problem under control as you restring the guitar. A clumped up mass of extra string at the peghead may have a casual or folksy look, but it can be a source of nasty noises. A string with severed windings like these will make just about the worst, deadest, buzzing noise you can get from an acoustic guitar!